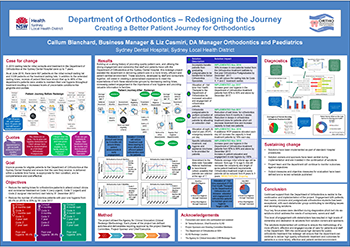 This project aims to reduce waiting times and improve the quality of care delivered to orthodontic patients at the Sydney Dental Hospital. Code Z (surgical intervention) from seven years to five years by 30 June 2018. To reduce the number of orthodontic patients with poor oral hygiene from 48.4 per cent to 20 per cent by 30 June 2017. Streamlines bookings and waitlist management. Provides appropriate care to patients in a timely manner. Improves the oral hygiene and health outcomes of patients. Reduces length of treatment time and the need for follow-up consultations. Improves patient satisfaction, engagement and education. Improves workplace culture and staff satisfaction. Gives patients the information they need to make an informed decision. Improves access to orthodontic equipment and staff for tooth extraction. The Department of Orthodontics at Sydney Dental Hospital is a statewide service that provides fixed and removable orthodontic treatment to patients across NSW. It is the only clinical training unit for the University of Sydney’s Doctor of Clinical Dentistry (Orthodontics) Program and is staffed almost exclusively by academic staff from the University of Sydney. In 2015, the Department had over 22,000 occasions of service and provided treatment to approximately 1000 patients. Due to the high demand for orthodontic treatment, there are strict medical and economic criteria for accessing the service. However, waiting lists prior to the project were up to seven years long for initial consultations and treatment. This was causing significant physical and emotional distress for patients and their carers. As of June 2016, there were approximately 907 patients on the consultation waiting list and 3036 on the treatment waiting list. These waiting lists have continued to grow, with the Department receiving approximately 100-120 new patient referrals each month. This not only negatively impacted the patient experience, but also the satisfaction of staff and efficiency of the organisation. In addition to extended waiting times, an audit conducted in 2015 found that up to 39 per cent of patients had poor oral hygiene, resulting in increased levels of preventable conditions such as caries, white spot lesions and severe gingivitis. Due to the length of waiting lists and poor oral hygiene, many patients who were referred for simple orthodontic appliances ended up needing surgical intervention, as their condition had severely deteriorated over time. As a result, treatment became more complex and difficult to implement. Poor oral hygiene can often lead to ongoing health issues, which places a further burden on the NSW health system. During the diagnostic and solution design phase, the project team conducted extensive data audits, focus groups, interviews and surveys with staff, patients and carers. Patient journeys were mapped and key stakeholders consulted on possible solutions. The following solutions were implemented in early 2017. Patients whose treatment had not been completed were transferred to senior orthodontic specialists, rather than first year orthodontic postgraduates. This reduced treatment time and allowed postgraduates to take on new patients from the waiting list. A full-time oral health therapist was allocated to the Department of Orthodontics, to improve education and engagement of orthodontic patients. This aimed to enhance the oral hygiene of patients and improve the effectiveness of their orthodontic treatment. Equipment was provided so orthodontic postgraduates could perform tooth extractions on patients. Previously, a lack of equipment meant these patients were transferred to other departments and added to new waiting lists. The referral process was also lengthy, further extending delays. By performing these extractions within the department, it was anticipated that delays could be avoided. Appointment management was improved by adding eight unscheduled emergency pain relief sessions each day. These appointments occur during orthodontic treatment for a variety of reasons. Allocating time for emergency treatments aimed to reduce confusion and delays in the clinic, resulting in a more efficient service. Patient information brochures were developed on the topics of orthodontic treatments, oral hygiene and appliances, to improve patient education and engagement. staff satisfaction, measured using surveys. Communication and transparency with stakeholders is critical for successful solution design and implementation. The patient experience can guide the future direction of the service. Defining and adhering to the scope of the project is both difficult and important. The Centre for Healthcare Redesign framework provides an excellent foundation for project management as well as strategies for identifying issues and engaging staff and patients in solution design. NSW Ministry of Health. Oral Health Specialist Referral Protocols. Policy Directive PD2011_071. North Sydney: NSW Health; 2011. NSW Ministry of Health. Oral Health 2020 – A Strategic Framework for Dental Health in NSW. North Sydney: Centre for Oral Health Strategy NSW; 2013.